It has been a cold and rainy day, which means our usual dog park play dates were cancelled. For my three high-energy aussies, a day inside is a recipe for disaster. I arrived home to pandamonium – dogs bouncing off the walls and furniture, toys strewn over every inch of the house, cardboard boxes stolen from the recycling bin and shredded into tiny pieces in every room, and of course the aussie talking, which today sounded like the high-speed ramblings of an excited teenage girl. So I went in search of some fun and stimulating games to play with the pups from the comfort of our living room. I hope you enjoy them as much as I did! Play a good game of fetch. If you have a two story house, this is an easy way to exercise your dog with little effort on your part and a lot of effort on your dog’s part. Stand at the top of the stairs and simply roll a ball down your stairs for your dog to chase. Call him back to you and continue the game. A simple game of fetch can incorporate multiple obedience commands to practice. As your dog returns to you, say “come.” Upon their arrival, ask for “drop it” to get the ball. You can ask your dog “sit” before you throw the ball, or even “down” as well. Mix it up and have fun with it! Play freeze dance. Get the whole family involved in this one. Put on some fun music, dance around the room and encourage your dog to get a bit silly. You can play a game of fetch, tug-of-war, or practice targeting exercises where they touch your hand as you move around; try anything that your dog moving. Have one person be in charge of the music, and when they are ready, stop the music. At this point, everyone has to freeze. You can have your dog go into a quick sit, down, or stand position and then go back to moving around once the music starts up again. Engage in an old fashioned game of hide and seek. You can play two ways. First, if you have two or more people in your house, this is a wonderful activity. Begin with each person having a handful of treats in their hand, standing somewhat close to each other (about 6 feet apart). One person calls their dog. As the dog arrives, give them a tasty treat and praise them. You can even hold onto their collar for a short amount of time to ensure they stay with you, giving them more praise and treats, if necessary. Then another person calls the dog and does the exact same thing. The players can start to move further and further away from each other, calling the dog back and forth. As the dog catches on to the game, players can start moving into different rooms, possibly “hiding” and gradually making it more challenging for the dog. If the dog can’t find you, don’t be afraid to offer a little encouragement with a whistle or noise to help the dog out. Second, if you don’t have another person around, you can teach your dog to “go find” a favorite toy or ball. Either have your dog sit and stay, or use their leash to tether them to a piece of furniture so they can’t run off or follow you. Show them a favorite toy, letting them sniff it and get excited about it, and then place the toy about ten feet away from the dog where they can still see the toy. Once they have it, cheer, praise them and get a little crazy! Continue with this exercise until you are able to get the toy a bit further away and start to hide it in various places around the house. If you hide the toy in another room, you may have to help your dog to find the toy by going closer to it’s hiding place. Play games. Dig out the treat ball, or create some treat obstacles for your dog. Put your dog in the bathroom for a few moments, while you set up the treat obstacles around the house. Use boxes or upturned wastebaskets and create a variety of places for your dog to hunt for his treats. If you don’t have any boxes you can also use blankets or towels and let your dog rummage through them to find the treats. Teach your dog a new trick. This will keep your dog mentally stimulated and reinforce your bond. I love this site for trick ideas and instructions: http://www.doggiebuddy.com/topics/Trainingtopics/traintopic3.html. Enjoy interactive games and toys. Interactive toys are a great way to sharpen your pets mind and reward him at the same time. These toys usually involve hidden treats in an object. It requires some skill to get to the food, so your dog needs to figure out how the toy works to get to the goodies. 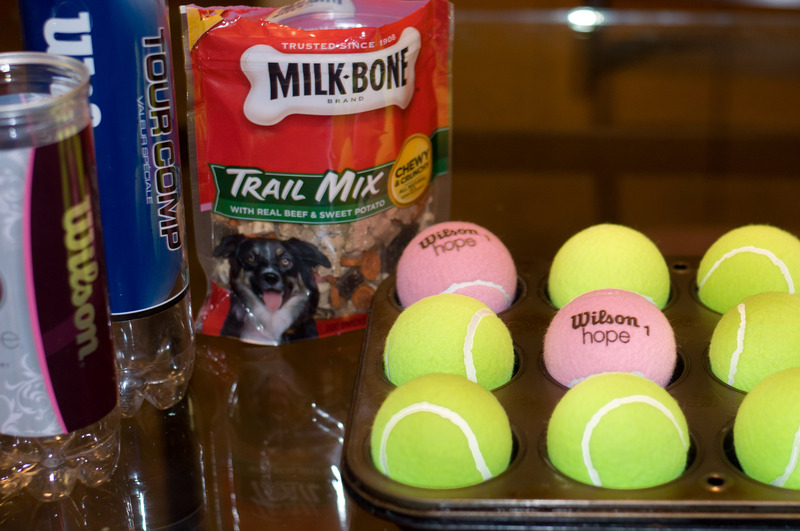 Products like Kong and Everlasting Treat Balls can be stuffed with treats or soft food. With both of these, your dog will need to lick, chew and even throw the toy to get the food out. Also, Nina Ottosson Games like the Dog Tornado, Wooden Dog Brick, and Wooden Dog, Treat Fighter are very unique puzzle games that contain compartments for food. Your dog needs to explore the toy to find the treats. You can even make your own simply by using a muffin pan and tennis balls! 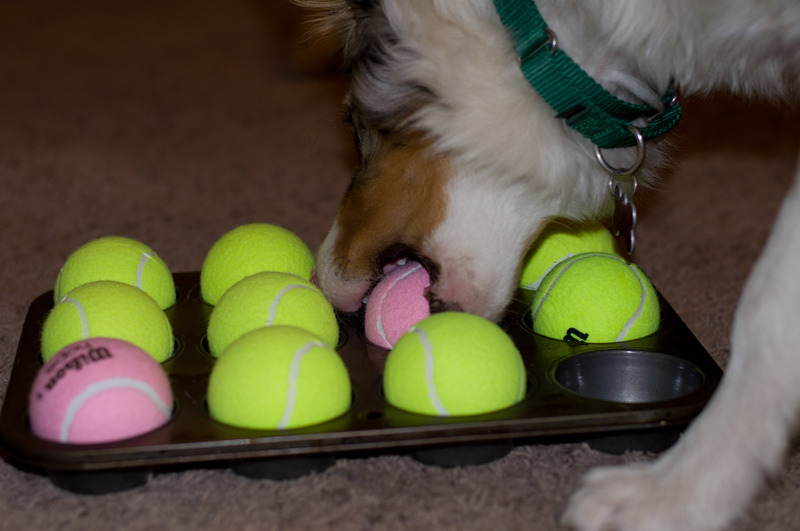 Just place small treats at the bottom of several of the muffin holes and place tennis balls into all 12 holes. 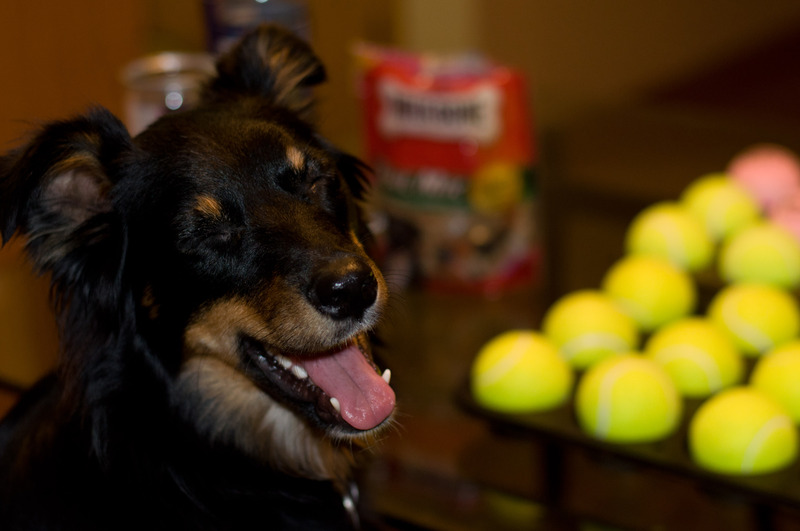 Your dog will need to sniff out the treats and remove the tennis balls to find their reward. Interactive toys can provide hours of entertainment for both you and your dog.Do you have a favorite game you like to play with your dog on days like these? We’d love to hear them!